Here is the final mitten video! When you finish this you should have a complete mitten. Don’t forget to knit two to make a pair. The great thing about plain stockinette mittens is that you can knit them exactly the same and they are interchangeable. I’m working on a pattern with cables that I hope to share in a couple weeks that will have a rigjt and a left mitten. 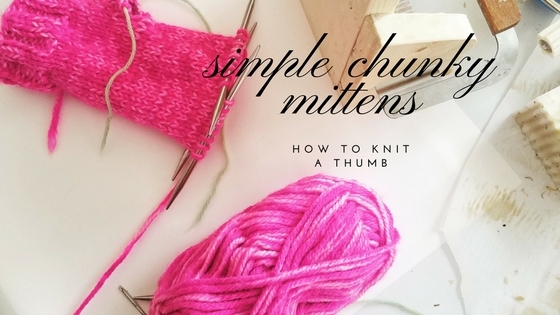 But first, if you want to learn how to make any mitten pattern into flip-tops, that’s what we’ll be learning how to do in my next video. So, when I filmed this video last week, I was so proud of myself for getting it done. You might not be able to tell, but while I was editing the footage, all I could think about was how sick I looked. Even my hair looks sick compared to other videos. I was suffering from what those of us who are unlucky enough to not be able eat wheat, barley, or rye like to call “getting glutened.” It was an awful couple of days, somewhere between your worst hangover and the most miserable days of morning sickness with a little bit of sea sickness and other digestive distress thrown in. And I was fighting a headache and twingy muscles for the rest of the week. I wanted to crawl back in bed and shut out the rest of the world, but I made a commitment to doing these videos, and being there for my kids, and meeting my wordcount. So I kept going. And I’m glad I did, because working through sickness is tough, and it’s a good reminder to take care of myself so I don’t have to. Take care of yourselves, ya’ll, whatever that means for you. And don’t forget to knit that second mitten. As always, here is the link to the written pattern, and if you would like to start the videos over from scratch, you can start the series here. And let me see those #mittenselfie (s)!